Leptothorax acervorum, an ant species with holarctic range, occurs in an isolated population in the Spanish Sierra de Albarracin. Dissection of dealate females and laboratory observations revealed that in contrast to other European populations, the colonies are monogynous, with one reproductive queen each and a variable number of virgin or mated dealate but not laying females. Most of the latter probably just hibernate in the mother nests, leaving them in the following spring, but a few remain there for longer time, without reproducing. Such colonies then are functionally monogynous. Alate females exhibit a stationary sexual calling, and mating behavior could be studied in the laboratory. Mated females return to the mother nest where they soon shed wings. When developing fertility before or after hibernation they are evicted from the nests; in nature they probably form daughter colonies. Patchy habitat and rough climatic conditions in the Sierra de Albarracin may be responsible for the particular reproductive behavior of L. acervorum in this area. 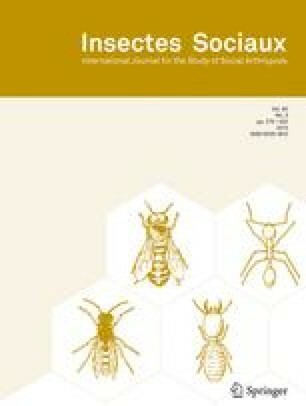 The generally small size difference between queens and workers in the subgenus Leptothorax entails high costs of dispersal and colony foundation by single queens who have to forage for their first brood. Some kind of dependent colony foundation therefore is frequently met with in the subgenus. Notwithstanding the marked biological and a few slight morphological differences between central European L. acervorum and the Spanish population its taxonomic status as yet is unsettled. We refer to this population provisionally as “L. acervorum Albarracin”. Key words:Leptothorax acervorum, functional monogyny, mating behavior, intranidal mated offspring hibernation, ecology. Received 24 November 1997; revised 4 May 1998; accepted 19 May 1998.